In April I wrote about urban “rightsizing,” and about Project Green, our city’s plan to tear down abandoned buildings and replace them with green space. That post generated a robust and thoughtful conversation, one that has motivated me to continue to reflect on and investigate what I believe is a wayward, wasteful and wrongheaded urban policy. This is another chapter in my examination of Urban Removal. For almost three years now I have been writing here about the future of cities. It has been a fascinating, sad, grim, tantalizing journey. Much about contemporary urbanism is horrible, wasteful, destructive, ridiculous, unfair, and useless as a foundation for the future. I am trying to find a way to the next city, the city of resilience, a sustainable, robust, dense, walkable urbanity filled with choice, rooted to its region and locality, and filled with equity, peacefulness, and joy. I can imagine such a place, and I can almost find that place in our past, but alas, dear Sancho, our quest has not shown us the way. The next city has remained a windmill. Until the other day. 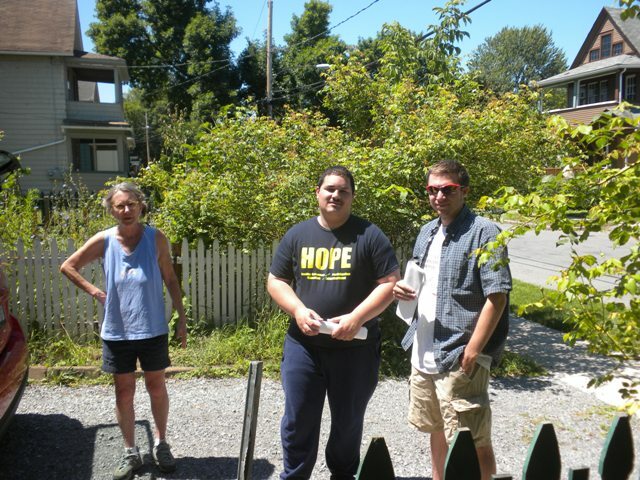 We saddled up Rocinante on Saturday, and headed to what was once called the Evergreen Tract, a part of northeast Rochester that has fallen on hard times. 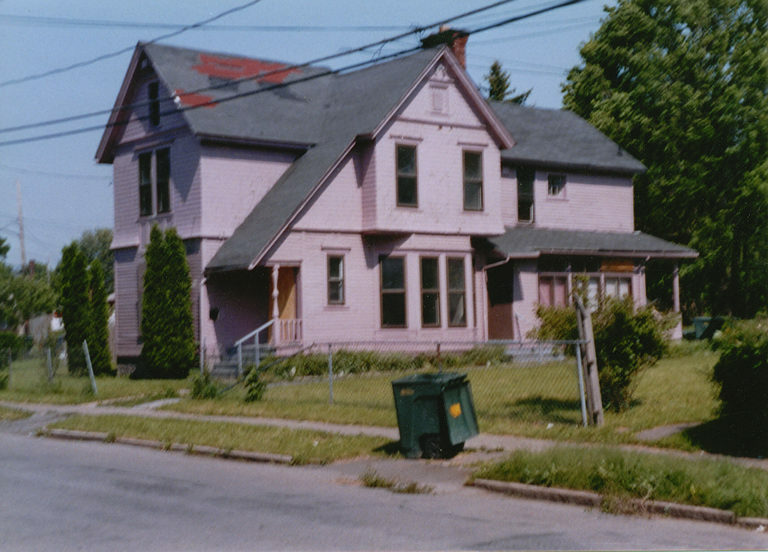 Like much of northeast Rochester, the neighborhood is peppered with abandoned buildings, empty lots, slated tear-downs, crime, vandalism, drugs – all the usual urban ailments that loudly tell us to stay away, man the wrecking balls, turn our gaze, give up hope. But the Evergreen Tract was once a pretty wonderful place. Take a look. 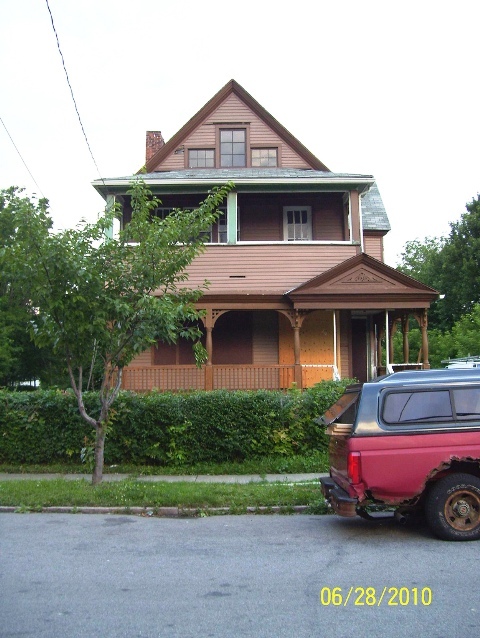 At the intersection of Clifford and Clinton stood the Walter house. This view, by the inestimable Albert Stone, is from about 1905, and gives you a sense of what the neighborhood once felt like. 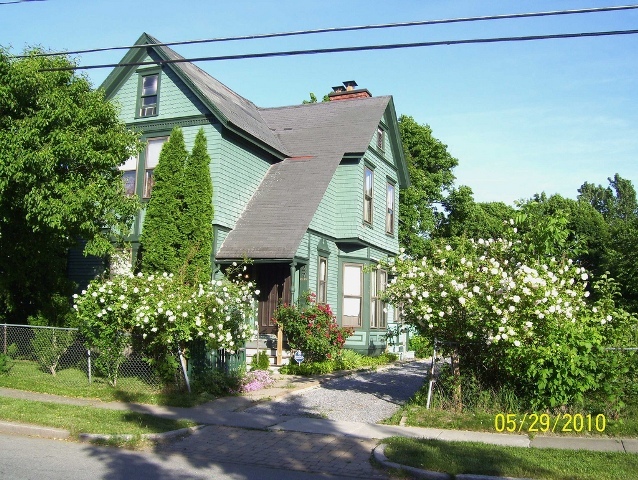 Bigger house, smaller house, garden, porch, sidewalk, street, block. Urbanism. 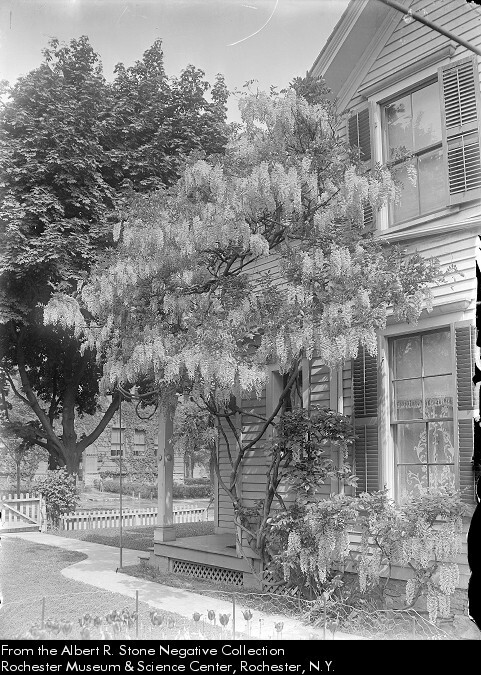 Nearby, at 120 Conkey Avenue, in 1909, Stone photographed what was then the biggest wisteria vine in town. A block or so south was the estate of banker and merchant William Corning. 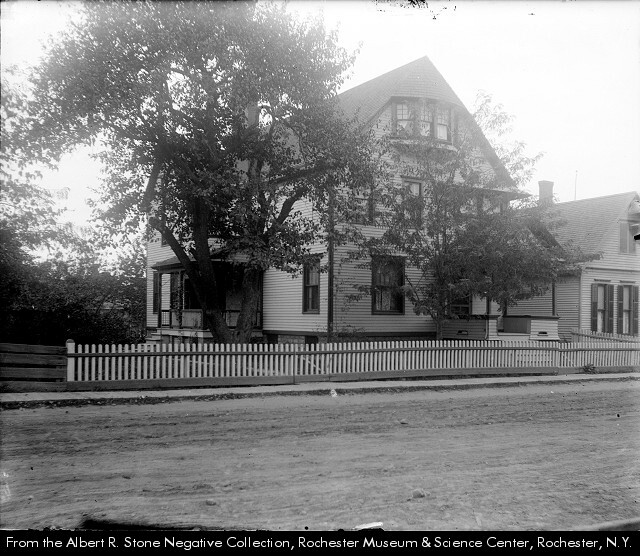 Here’s what it looked like in 1890. 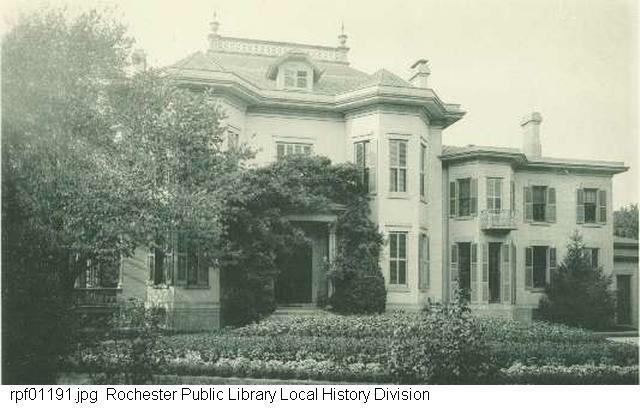 It’s long gone now – razed in 1930. And sadly, the neighborhood’s fate was foretold in the mid 20th century, when the streetcar tracks in nearby St. Paul Boulevard were pulled. 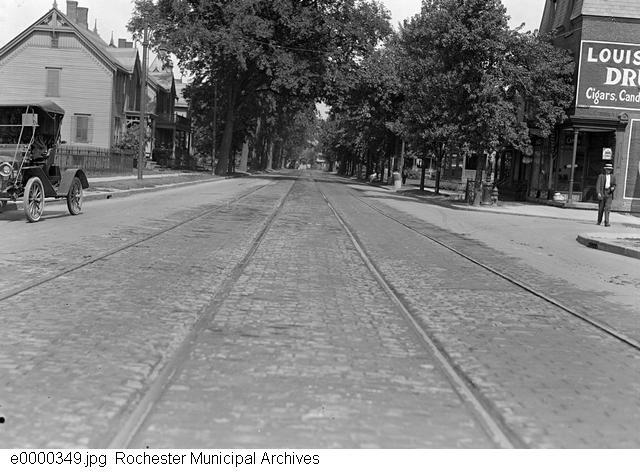 First is St. Paul with the tracks, then a view in the 40s as they were ripped out. 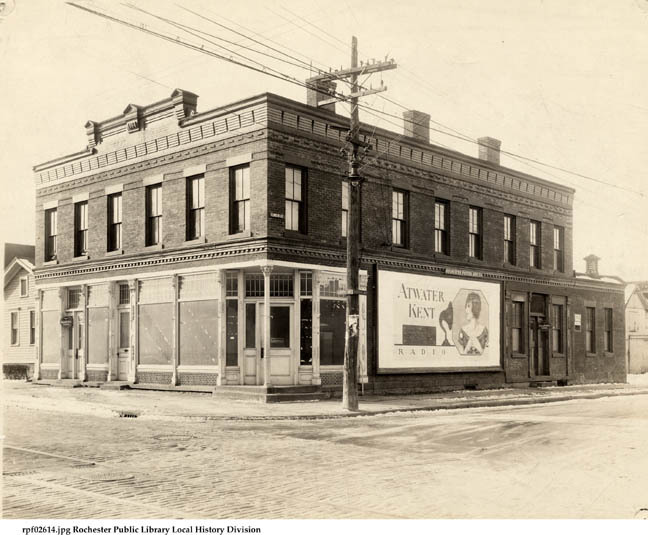 Evergreen and St. Paul, in 1913. Near Evergreen and St. Paul, 1942. Well, not quite like this. Sadly, a bunch more buildings are gone since this 2005 photo. And here is where we discovered some folks who are building up the city, and the neighborhood, one building and one block at a time. Project Hope (Healthy Outcomes through Participation, Education and Empowerment) is funded by the Greater Rochester Health Foundation. What began as a grass roots action to assess the broad health concerns of residents of a targeted area in the NE has evolved to serve a wider purpose, culminating in resident-owned projects to beautify the neighborhood, the creation of block clubs, organizing against decay, and other efforts geared to stabilizing the neighborhood. Miguel and his colleagues are on the streets every day, working with neighbors, getting gardens planted, helping fixer-uppers, trying to root out the druggies, and doing a host of other things that no one else is doing, or wants to do, in this part of the city. Slowly, slowly, it’s working. Here’s Miguel, with Amy and colleague Bob Williams. 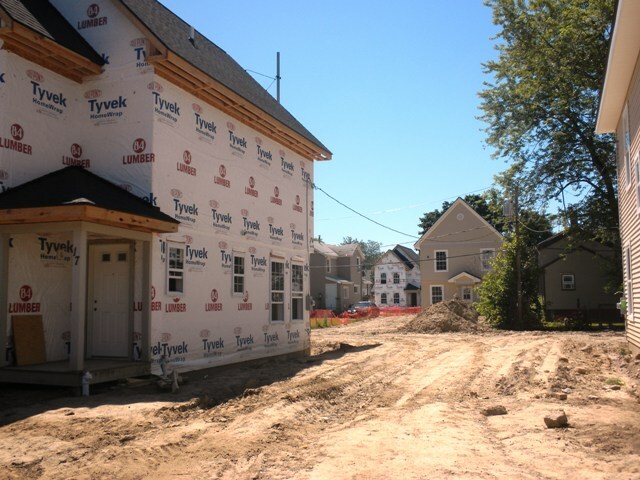 Just east of the Evergreen Tract, in what was called the Lee Tract in the 1910 plat, IADC, in association with Rochester’s Cornerstone Group, Ltd. (RCG), is creating a new development of 25 rental homes – the El Camino Estates. The name of this project is a bit odd – estates? 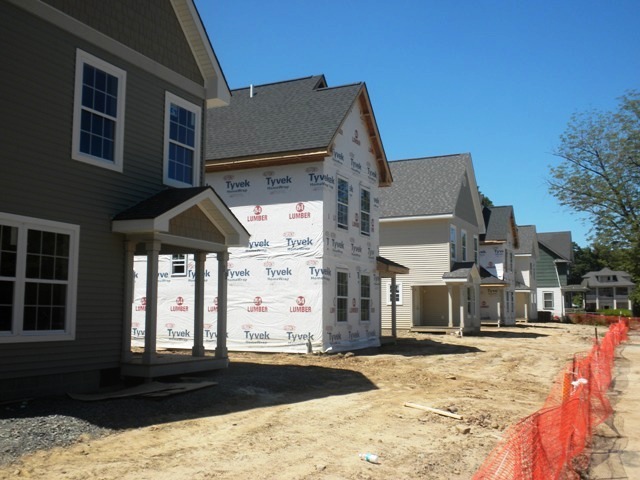 – but the 25 rental homes under construction represent a nearly unbelievable investment in the neighborhood’s future. Spread over a couple of blocks, the new and what’s left of the existing now begin to make the neighborhood whole. I wish these things had bigger porches, but not bad at all. A bit suburban, perhaps, but not too bad. I know – projects like this are happening in many cities, and are helping to transform empty lots into real urban places again. This is not the only one of its kind in an American city, but it is unique in our city. And we should acknowledge how much better, and saner, it is than the results of the last wave of urban removal. Great work, IADC and RCG. Really great work. It would have been easier, better, and cheaper to have recycled the empties that once stood here, but by the time El Camino got started, not much was left. Which brings us back to the Evergreen Tract, and to the real punchline of this story. There are two people who live in the Evergreen Tract who are not developers, are not non-profits, are not consultants, are not getting funds from the City, the State or the Feds. She, Jo, is a retired teacher, and he, Jim, works for a company here that makes an array of instruments and gauges and valves. They love cities, and old architecture, and even old buildings in big, big trouble. They are true urbanists. They quote Jane Jacobs. They love their neighborhood. They hate wasteful and destructive demolition, something they have seen way too much of over the last few years. 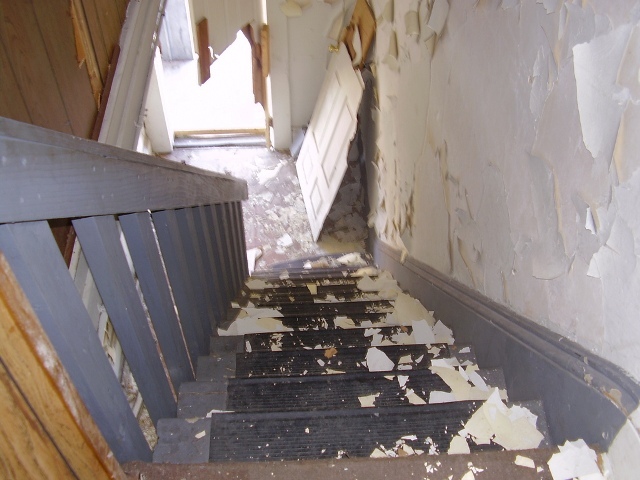 They are puzzled by a city that wants to find a simple tear-it-down solution to a very complex problem – a crumbling, faded and distressed neighborhood that needs all sorts of help that demolition can never provide. And they love that old buildings tell us stories – about their making, their inhabitants, and the layers of now destroyed neighborhood fabric, and history, that are the last remaining vestiges of a once vibrant urban place. They have lived in the Evergreen Tract for quite a while. 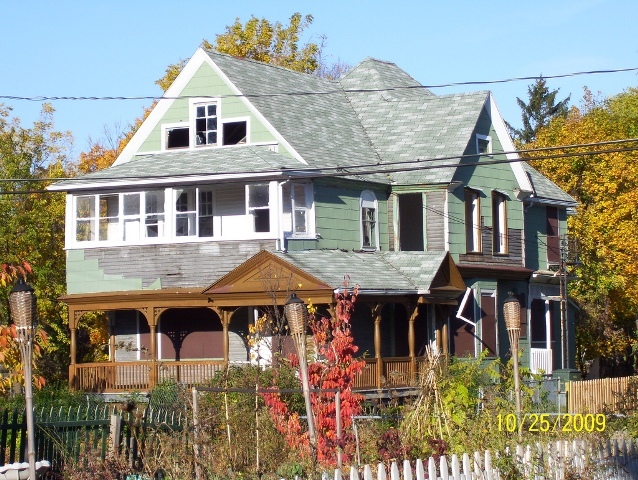 But in the last few years they started doing something that is pretty unbelievable: they started buying and fixing up abandoned houses on their block, on the street behind their house, and on a nearby side street. 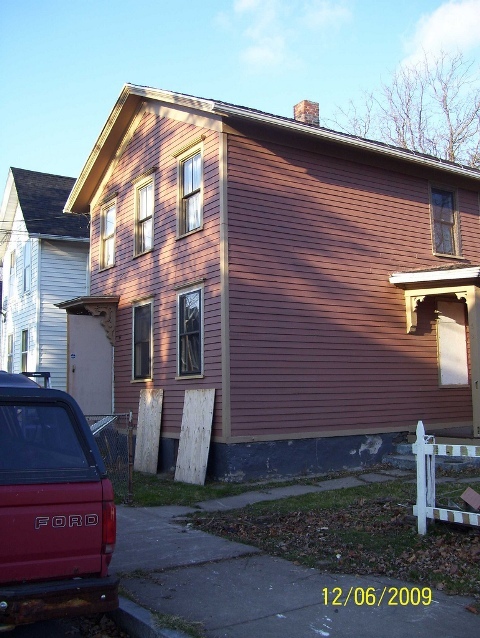 They now have six houses in various states of restoration. We toured them. Here are a few images of their work. They got these places at auction. None of them was very expensive. All of them were in bad shape – abandoned, looted for anything of value, many partially burned, most with bad roofs, missing plaster, broken stairs. All of them had been made into apartment buildings by the middle of the 20th century. 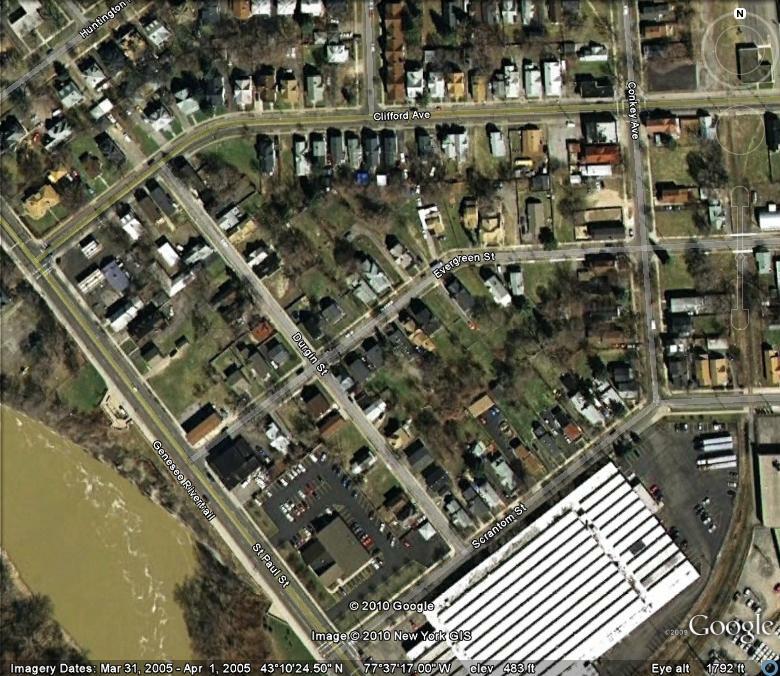 As Jim told us, one of the real problems of the neighborhood, ironically given all the empty lots, is overcrowding. They do almost all of the work themselves. Almost all. Jim doesn’t do roofing, so that has to be hired out. Short of that, he’s the man. They don’t spend much getting the work done – some, but not much – and the work goes slowly because the crew consists of two part timers. But the pictures tell the tale – progress is real. On that budget, the IADC and RCG could never do what they are doing – the cost of sweat equity is the slightest fraction of what El Camino is costing per unit, as good as it is. The tiniest fraction – maybe 15% of what El Camino costs. I want to say this again for emphasis. The cost of doing this kind of rehab is not much more than the city pays to have the buildings demolished. The city wants to demolish 3,000 homes in their Project Green, at a stated cost of $23,350 per building (total: $70,000,000). 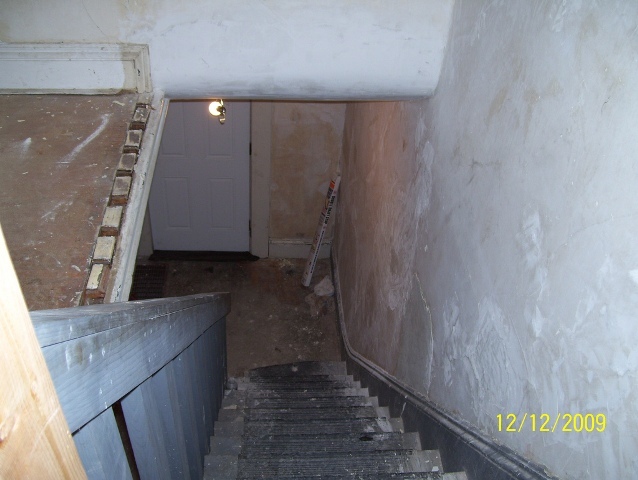 Our rehabbers are spending that or just a bit more than that per building to work their magic. And when they’re done: real plaster walls, restored trim, windows that are historically correct, porches to sit on, beautiful wood floors. Magic. While they were in the midst of all this rehab, they managed to create a proposal for the whole neighborhood. 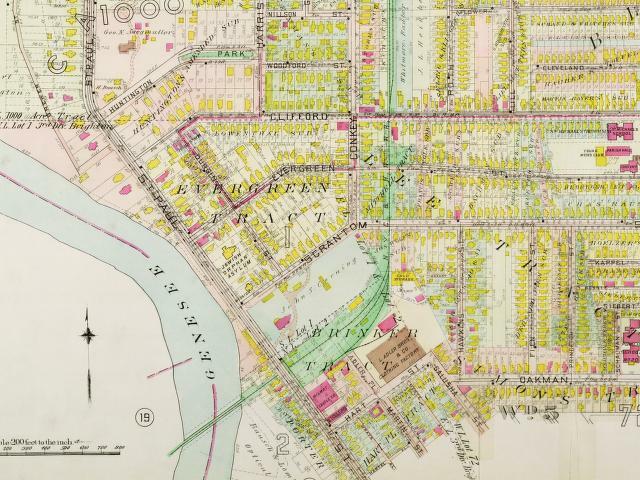 It’s called the “Conkey/Clifford Reinvestment District Proposal.” I have a draft entitled version 8b – they were at this a while – and it is a spectacular document. 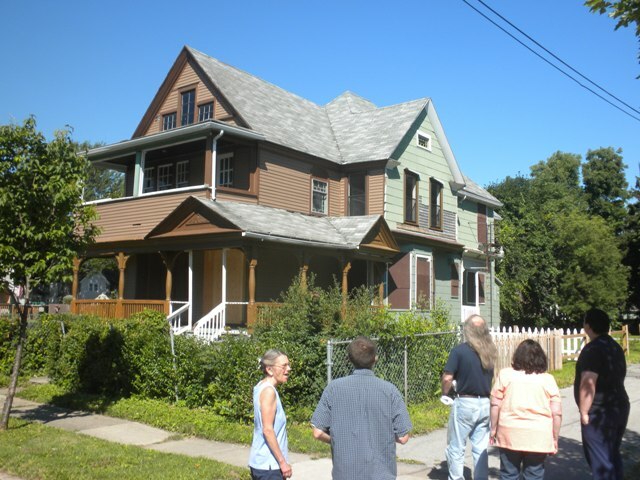 They worked with the Rochester Regional Community Design Center (RRCDC), and the proposal sets out three phases for the revitalization of the neighborhood. First is stabilization – root out crime and drugs, deal with vacancies, stabilize the empties, cut the grass (by the way, the grass is always cut at all of their projects), pick up the trash. Make the place seem like it has some hope. Next is revitalization. Bring the neighbors together, hold events and meetings, find those who want to sweat their way into a home, create pride of place. Then comes redensification (their word – it’s about remaking the neighborhood). Increase residents, businesses and activities in the neighborhood. Each step is described in detail. 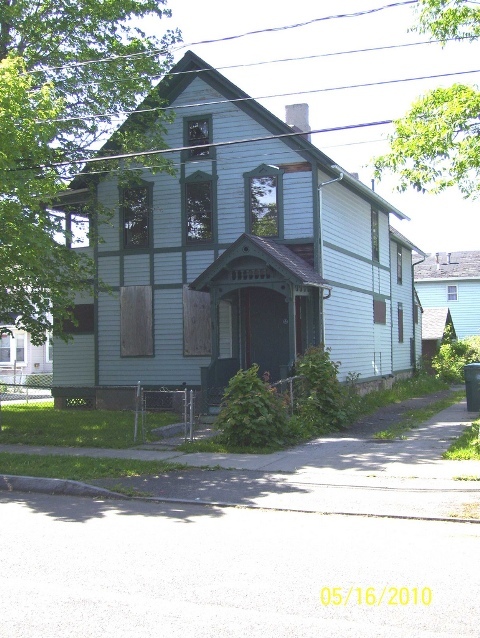 The proposal cites other, similar, and successful projects around the country, like Providence’s SWAP, Inc. (Stop Wasting Abandoned Properties). And the proposal defines roles for neighbors, organizations that can lend a hand, and the city. It’s not a typical kind of urban program. It is not designed to work everywhere – just in Evergreen. It is specific and local. It is incremental. It is conditional. It is based on the assets and tools at hand. It requires a sense of powerful commitment, and stewardship, on everybody’s part. It is a cloud, not a silo. It is decidedly not bureaucratic, and would not make great legislation. But it would work. The proposal went to the city, meetings took place, but in the end, it proved to be a kind of inconvenient truth, and was deflected. In a city like ours, scrambling for every dime, struggling with all the typical urban dilemmas like shrinking services, crummy schools, and waning tax revenues, it’s understandable that we citizens tend to want simple and cheap solutions. And it’s understandable that increasingly overworked city employees want programs like Project tear-it-down Green, that are crisp and clear and easy to administer. All this is understandable. But it’s wrong. It is not more expensive for the city to help folks like our gentle rehabbers do the messy work of repairing our urbanity. It just requires us to think, reason, and connect not with a set of rules, but with a new set of possibilities. 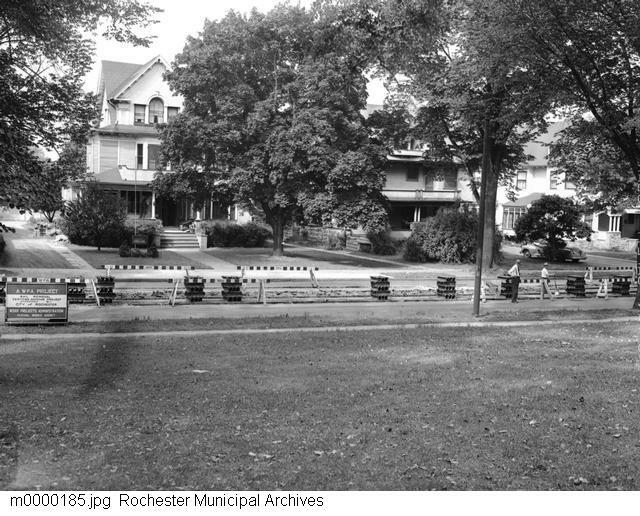 City of Rochester: don’t tear anything else down. Stop. Think. Listen to your wisest citizens like Jo and Jim, and embrace their intelligence and their passion. Don’t ignore them, empower them. We need to say that we want to keep every home, and every citizen, in any way we can. Demolition of abandoned buildings here is a surrender to defective reasoning. 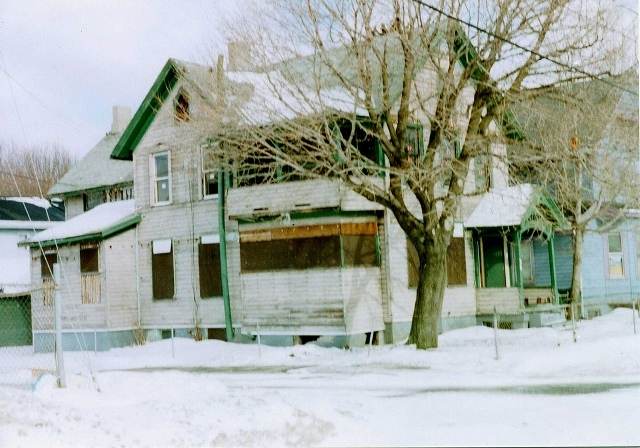 Demolition is expensive, it doesn’t save neighborhoods, it doesn’t create opportunities (except maybe for parsnips), it doesn’t heal our urban wounds or bring us together, it doesn’t save our past, and it doesn’t show us the way to a useable future. We had quite an optimistic day in Evergreen. Thanks Miguel. Thanks Jo. Thanks Jim. “Few things are harder to come up with than a good example.” Mark Twain.